The most famous equation in science, E=mc², implies that light can be transformed into matter — but it's only now that scientists have figured out a way to make that transformation routinely on Earth. The concept for a new kind of photon-photon collider, laid out in the latest issue of Nature Photonics, follows up on an 80-year-old theoretical claim — and there's a chance that the concept could soon be turned into reality with existing technology. "Although the theory is conceptually simple, it has been very difficult to verify experimentally," Imperial College London's Oliver Pike, the study's lead researcher, said in a news release. "We were able to develop the idea for the collider very quickly, but the experimental design we propose can be carried out with relative ease." Albert Einstein's equation on mass-energy equivalence suggested that a tiny amount of matter could yield a tremendous amount of energy — which was demonstrated by the development of nuclear weapons and fission reactors. But that also means it would take a tremendous amount of energy from photons, the fundamental particles of light, to yield a tiny amount of matter. In 1934, physicists Gregory Breit and John Wheeler said the light-to-matter feat was theoretically possible but doubted it could ever be demonstrated in the lab. "Today, nearly 80 years later, we prove them wrong," Imperial College's Steve Rose said. The concept calls for using a high-intensity laser to speed up electrons to nearly the speed of light, and then smashing them into a slab of gold to create a beam of photons a billion times more energetic than visible light. At the same time, another laser beam would be blasted onto the inner surface of a small gold container known as a hohlraum (which is German for "hollow space"). That would create a high-energy thermal radiation field, buzzing with photons inside the container. The photon beam would be directed into the center of the container, and when the photons from those two sources collide, some of them should be converted into pairs of electrons and positrons. 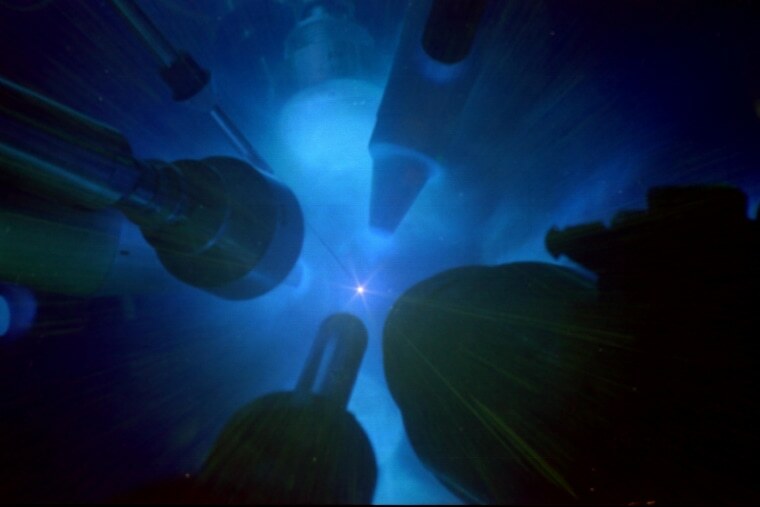 A detector would pick up the signature of those particles of matter and antimatter as they flew out of the container. The key piece of the puzzle is the hohlraum, which is also used in laser fusion experiments such as the National Ignition Facility in California. "Within a few hours of looking for applications of hohlraums outside their traditional role in fusion energy research, we were astonished to find they provided the perfect conditions for creating a photon collider," Pike said. "The race to carry out and complete the experiment is on!" Among the potential sites for the experiment are the Omega laser facility at the University of Rochester in New York and the Orion laser at AWE's nuclear lab in Britain, according to The Guardian. Why do it? The experiment would complete physicists' list of the fundamental ways in which light and matter interact. Researchers say it would re-create conditions that are thought to have existed during the first two minutes of the universe's existence — and that arise during gamma-ray bursts, the most energetic explosions seen in the universe today. It would also confirm an as-yet-untested implication of E=mc². And that suggests something else: If scientists and engineers could harness the matter-to-light conversion to produce nuclear energy, what magic might they do with the light-to-matter trick? "I'm a physics professor at UC Santa Cruz and a longtime user of the facilities at the SLAC Linear Accelerator Center on the Stanford campus (where you may recall that quarks were discovered in the late 1960s). It is NOT true that the Breit-Wheeler process has never been discovered before. In fact, at this very moment I happen to be running a little experiment using the very same electron beam that a group headed by Adrian C. Melissinos of the University of Rochester used way back in 1997 to demonstrate this process. ... So while the scientists in the article may be making it much more copiously than in the past, they are not the first to produce matter by colliding beams of light!" Schumm points to a New York Times article about the experiment, which was described in Physical Review Letters. The 1997 article in the Times said Melissinos and his colleagues "confirmed a longstanding prediction" by Breit and Wheeler about using light to create particles. One caveat is that the SLAC experiment depended on a complicated interaction with a beam of high-energy electrons — and that's the thread on which Pike and his colleagues hang their claim for the novelty of the proposed photon-photon collider. Their paper in Nature Photonics even cites the earlier work, saying that such experiments don't qualify as pure photon-photon collisions because they "involve massive particles." Sounds like Schumm and Pike could have an interesting conversation, as long as they keep the tone ... light. In addition to Pike and Rose, the authors of "A Photon-Photon Collider in a Vacuum Hohlraum" include F. Mackenroth and E.G. Hill.